Released in September 2008 to coincide with the first performance, this CD features Conductor Stephen Darlington, soloists Natasha Marsh, Alfie Boe, and Christopher Maltman, with the Choir of Christchurch Cathedral,Oxfordand London Musici. 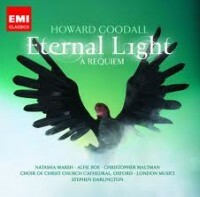 Three other choral works by Howard Goodall are also included in this CD: his setting of Psalm 23, well known as the theme tune of the BBC s Vicar of Dibley series; Love Divine, a hymn of praise set to Charles Wesley s reassuring, open-hearted words; and, finally, Goodall’s setting of Spared, Wendy Cope’s poem capturing the feelings of many people following the destruction of the World Trade Centre in New York on September 11, 2001. For more information about this piece click here.